First time ever – my four year-old requested vegetable soup for lunch. This was after I told her three times that No, she could not have the leftover waffles from her breakfast. I offered her my home-canned tomato soup and she countered with vegetable soup. I’ll take it. She helped get everything out of the fridge, chopped, stirred and seasoned the soup. 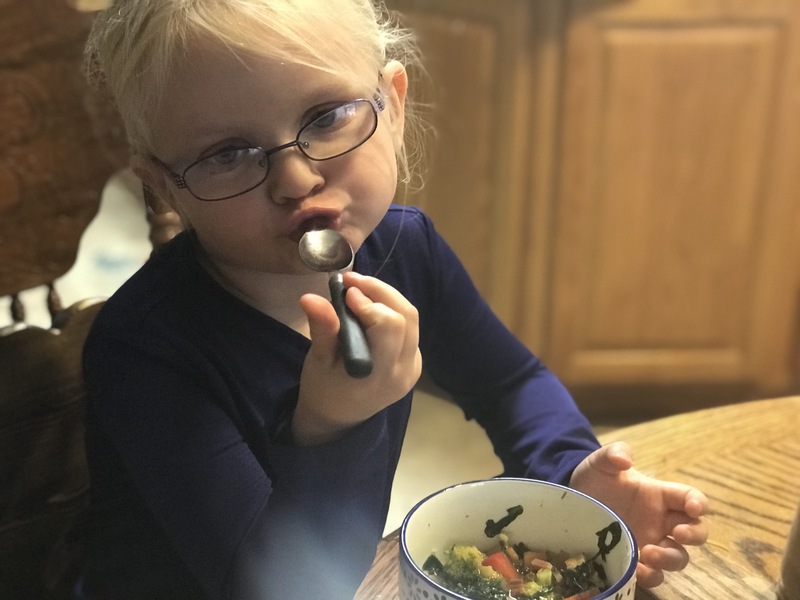 It was SALTY, but when we sat down to our quiet lunch, she was engaged and made up a blind tasting game where we had to guess which vegetables were on our spoon just by taste. It was a good way to get a daily dose of bone broth into her, and I haven’t enjoyed such a peaceful meal in quite a while. She ate well. Celebrate the small victories, right?